His name is Pneuma, and he’s birthed into the void instantly triumphant. “In the beginning, me!” he yelps, his voice already slightly too strained, slightly too confident. Even before he begins to draw the world into being around him, Pneuma is pretty damn certain that he’s a god. He must be. “There’s only one logical conclusion,” he says, barely pausing for breath. First there’s light, sweeping upward like curtains opening, then classical architecture, slotting into place like a paper model, then great brushstrokes of gold and marble, surfaces reflecting each other immaculately. And then the world is complete, and Pneuma strikes out into it, chattering away to himself and conveying very little indeed. 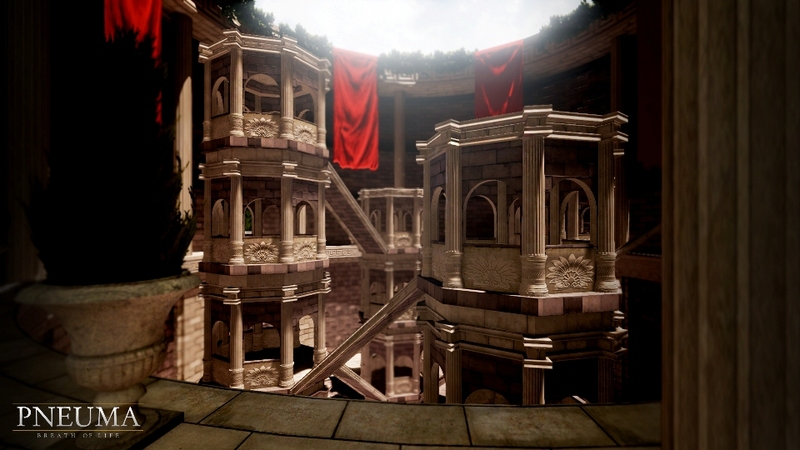 Pneuma: Breath of Life is a game that wants to say a great deal. It uses the (now standard) first person puzzle format pioneered by Portal, in which a disembodied voice plays out a story between segments of problem solving. But where GLaDOS used her allotted time to take shots at the protagonist’s incompetence, Pneuma has higher aspirations, namely “exploring the ontological mystery of the breath of life.” Unfortunately, the writing is so muddied and the vocal performance so frenetic that the game ends up feeling a little like someone who knows they’ve lost control of their argument but keeps talking nonetheless. There’s a strange confusion at the heart of Pneuma’s characterization; the game can’t seem to decide whether to portray him as a naive, self-aggrandizing god, blundering from puzzle to puzzle and showing off his world like a proud kid, or as a nuanced philosophical thinker. In the introduction to one puzzle chamber, he wonders without a hint of irony if, since he’s able to move a platform in space by looking at it, he can also move it to tears. That wouldn’t be so bad if by the end of the same chamber, he wasn’t attempting to deconstruct logical proofs of his own existence with such speed and ferocity that they’re rendered essentially meaningless. 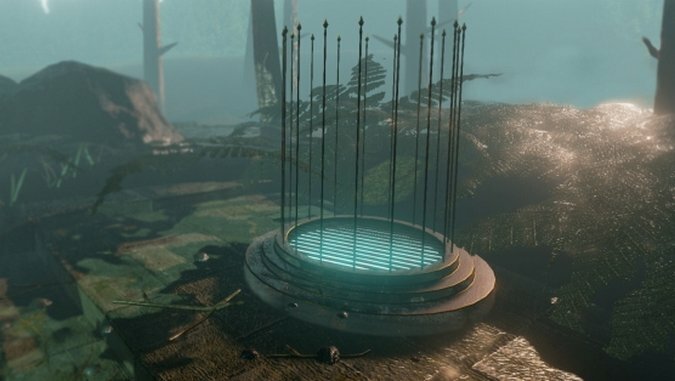 Over the course of the two-and-a-bit hours of the game, Pneuma asks three questions over and over again, albeit rephrased into endless, similar variations. Each new chapter begins with him suggesting something vague and open ended, and then between the puzzles performing the philosophical equivalent of scales and arpeggios: dancing up and down the ideas rapidly and mechanically without any real coherency or melody. It got to the point where I began to take a guess at what Pneuma would say before I started a new level. “But why am I here?”, I’d ask the screen, and hear my question immediately repeated back to me in as many words. And it all happens so fast! Pneuma speaks so breathlessly and directionlessly as you glide slowly through the levels that any attempt to find a narrative through-line or cling to an idea for more than a minute falls short. I can understand the desire to have a fast-talking, quick-witted protagonist, but it’s as though Pneuma is speaking entirely without punctuation. There are no quieter moments of introspection, no chances to breathe and take stock. Pneuma is the friend who is so afraid of silences in conversation that they plow forwards regardless of what exactly they’re talking about. The game looks great in a sort of flat, empty way. Built using Unreal Engine 4, warm sun beats down onto a variety of classical buildings, gleaming marble, and crisp stonework. The spaces feel sparse and utilitarian despite their grandeur; this is a world created by someone who doesn’t need to eat or sleep, but is pretty confident that they love gold. Exactly how and why the world works are questions constantly posed by Pneuma—he wonders if he’s already aware of the contents of all the books in his library, since it was him that called them into being—except they’re dashed off without any conclusions drawn or any narrative interest generated as a result. The library is forgotten about instantly, as is the bench, as is the suggestion that he might want a companion. His mind circles unsatisfyingly around and around the same questions as you solve the collection of puzzles. Most of the puzzles are thematically linked to questions of perception and control, though beyond this, sit entirely apart to the rest of the story. Why, exactly, am I rotating slowly around backwards in an attempt to align portions of a gigantic floor painting with the faces blurred out? Why am I peering through the glass plates of this orrery while Pneuma wishes he had a girlfriend? In the hallways of Portal’s Aperture Science, the player is testing the capabilities of a specific device; in The Talos Principle, they’re performing abstracted trials for a distant figure. Here, beyond the thin thematic allusions, they exist in the world only to slow your progress. In general, they’re not tremendously difficult, relying largely on execution of a plan rather than problem solving. You might have to ensure you’re staring simultaneously at three eyes scattered around a room, or jumping between platforms that rotate as you do. If you fail, you climb up the warm stone steps and begin the puzzle again. It’d be unfair to suggest that there’s not some form of narrative resolution, but rather than a moment that draws all the threads together satisfyingly, the game delivers a closing sequence that rapidly and abruptly answers several questions and completely disqualifies others. It’s not an ending that recontextualizes that which came before, so much as one that slams a door closed on the game just as it was beginning to get interesting. Pneuma moves through three or four emotional states in a matter of minutes, before coming to a final resting place having changed very little. I’m struggling to say much about the ending for fear of spoiling the game’s more interesting moments, but the developers manage to achieve something genuinely disconcerting in the final moments of the game, something made all the more interesting by the fact that it’s mechanics that provoke this, not narrative. That said, it’s an idea that’s so barely developed or given time to to make any impression that I’m left wishing I’d seen more. And that’s where I stand with Pneuma: Breath of Life, really. I wish the developers had given the more interesting elements of the game more time to breathe. I wish Pneuma had been a little less hasty—a little more interested in conveying why exactly we should care about his rushed philosophical ponderings than racing to solve high school thought experiments. In a game about creation and existence and perception, I’d have loved some sense of what it would actually feel like to be birthed from the void into a world that was, for all intents and purposes, yours. Instead I got Pneuma, talking nineteen to the dozen about whether he was moving towards corridors or corridors were, in fact, moving towards him. In the very final moments of the game, after a sequence that introduces something unexpected, the camera suddenly points itself straight up at the sky, then, rotating slowly, drops downward until I am staring at the ground. I can’t move. The dialogue continues, and for a moment, I think the game is doing something weird and new and interesting that, in context, would make a great deal of narrative sense. And then I look down and find that my controller has turned itself off. I turn it on and finish the game and stare at the menu for a little while. I play the first chapter again. “In the beginning, me!”, says Pneuma, and I realize that in the short time I’d known him, he hasn’t changed at all. Jack de Quidt is a writer and a composer who designs games at The Tall Trees and talks over videogames as part of the Streamfriends. You can find him on twitter at @notquitereal.